German investor confidence fell to a record low in July as surging inflation and slowing export growth started to cloud the outlook for growth in Europe's largest economy. 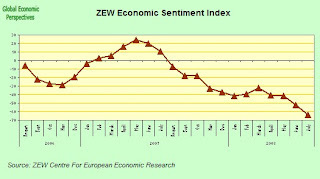 The ZEW Center for European Economic Research in Mannheim said its index of investor and analyst expectations dropped to minus 63.9, the lowest since the index was first compiled in December 1991, down from minus 52.4 in June. As a stronger euro weighs on exports and the U.S. housing slump damps confidence worldwide, Germany's benchmark DAX share index has dropped 7 percent in the past month and 23 percent this year. The dollar fell to a record low against the euro again this morning, hitting $1.6038 at one point. The dollar thus extended this year's 10 percent slide following concern that confidence in the debt of Fannie Mae and Freddie Mac will deteriorate even after the U.S. government pledged support for the buyers of home loans. 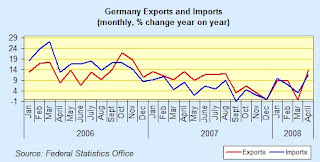 The stronger euro is putting pressure on German exporters already coping with a slowing global economy. The currency has gained 15 percent against the dollar over the past year, while the crisis in U.S. subprime mortgages has been sending shock waves through financial markets and reducing the outlook for global growth. German exports declined the most in almost four years in May, as a slowdown in some key eurozone economies (Spain, Italy) and a stronger euro curbed demand. Sales abroad, adjusted for working days and seasonal changes, decreased 3.2 percent from April, the Federal Statistics Office said this morning. That was the biggest drop since June 2004. Reuters are reporting that the listed Spanish property company Martinsa Fadesa have been suspended from trading this morning following the request from the Spanish property firm last week for extra time from the banks to obtain additional credit in order to maintain its refinancing obligations. Martinsa Fadesa said on Friday it had asked creditor banks to waive a requirement that it obtain a 150 million euro ($235.7 million) loan - to make scheduled interest repayments - until August 7 after the deadline for obtaining it expired. The company is due to hold a board meeting at 14:30 CET. Shares fell 25 percent to 7.30 euros this morning before the Spanish stock exchange regulator suspended trading. On Friday, they fell almost 34 percent after the company said it had asked creditor banks to give it until Aug. 7 to obtain a loan the loan it needed as part of a refinancing agreement reached in May. In a regulatory filing, the company added that it had asked for the waiver because the deadline for obtaining the loan had expired. Former Real Madrid President Fernando Martin's company Martinsa Fadesa started to be back in the news again last Friday, simply becuase they found themselves unable to raise a 150 million euros payment they should have made as part of a refinancing agreement reached in May which would have let the company put off paying the lion's share of its approximately 5 billion euros of debt until at least 2011. Basically back in May Fadesa was forced to renegotiate 4 billion Euros of its debt with a consortium of lenders (including several big bank names like Ahorro Corporacion Financiera, La Caixa, Caja Madrid and Morgan Stanley - who are all lead arrangers of the company's 5.1 billion euro loan, and hold more than half of it. Other debtholders include hedge funds and Collateralised Loan Obligations (CLOs) who reportedly control "less than 10 percent" of the debt). 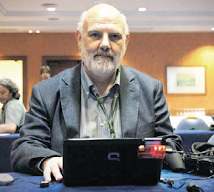 Now Martinsa Fadesa has failed to meet a key condition of the agreement then reaced, namely to secure a 150 million Euro loan from Spain’s Institute of Official Credit (ICO). The ICO has refused a loan on the grounds that it does not finance private housing developments. Essentially Martinsa-Fadesa should have known that at the outset, so they seem to have only been trying to buy time with the application. That time has now run out. So Martinsa-Fadesa announced on Friday that it had asked its creditor banks for an extension to the deadline for the 150 million euo payment to August 7. Obviously without the loan Fadesa may well be forced into voluntary administration to seek protection from its creditors. My view is that even acquiring the loan would simply have been putting of the inevitable, but of course the banks are very reluctant to accept a complete default onto their books, since under Spanish law they would have to put the full amount of the outstanding debt - estimated at around 5 billion euros - aside until the receivership process is terminated (which would take some time) and they are already short of cash. Obviously everything in the mortgage backed securities and construction area moved up a notch on Friday, with the much heralded problems of FannyMae and FreddyMac, as well as the less widely covered failure of IndyMac, and the urgent rescue of Roskilde Bank in Denmark. 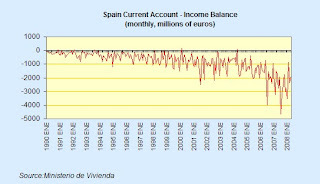 Basically, the already parlous state of the cedulas hipotecarias just got a touch more parlous, while the prospect of any early opening of the international wholesale money markets to securities issued by Spanish banks seems now to be shooting off over a very distant horizon. In a move whose connection with what is happening to Martinsa-Fadosa is not at all clear at this stage, the Spanish government postponed last Friday a planned sale of 15-year bonds - ostensibly because investors are shunning the debt on concern that the fastest inflation and slowest economic growth in more than a decade will erode returns, however we should not forget that Spain's banks are leaking money, as they are forced to find the ways and means to both fund the country's 9 billion euro monthly current account deficit and provide some fresh lending for mortgages for the hard pressed construction sector. Ivan Comerma, Barcelona-based head of fixed income at Caixa Calatunya is quoted as saying the government will wait until demand improves. Comerma said he had been approached bythe banks hired to sell the securities. Raphael Gallardo - strategist at Axa Investment Managers in Paris - who was also approached, is quoted as saying that the deal was "put on hold" due to "the string of bad cyclical news coming out of Spain in recent weeks has turned investors more cautious on the credit." Spain's bonds gave investors a loss of 3 percent in the three months to the end of June, the worst quarterly performance in 14 years, according to Merrill Lynch & Co's Spanish Government Index. 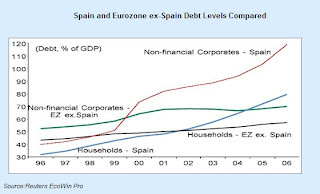 Enrique Ezquerra, deputy director of public debt at the Treasury in Madrid, is quoted as saying that the government is "monitoring the market" and will issue the bonds in the third quarter "if market conditions are favorable." Spain appointed Banco Bilbao Vizcaya Argentaria SA, Calyon, Dresdner Kleinwort, HSBC Holdings Plc, Banco Santander SA and Societe Generale last month to arrange the sale of the euro-denominated debt, its debut issue of 2023 securities. 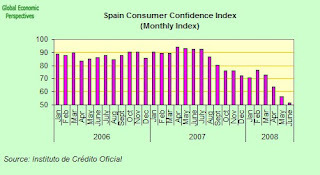 Well, in this sort of environment it is hardly surprising, but Spain's confidence index hit a new historic low this month. 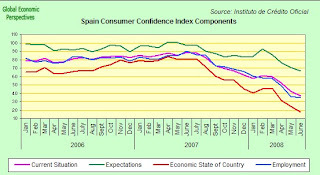 I guess that isn't saying too much, since the index was only started up at the begining of 2005, but still, as can be seen from the chart below the fall in the Instituto de Credito Oficial (yep, the same people Martinsa-Fadesa wanted to borrow money from) consumer confidence general index has been striking and unrelenting since last July, and indeed we are now down to nearly 50% of the from the April high point, having fallen from 94.4 to the current 51.7. 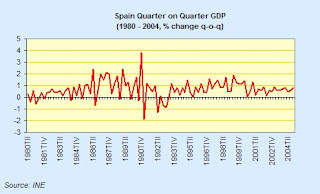 All the sub components in the index have been falling sharply, but perhaps most interesting of all is the appreciation that most Spaniards now seem to have of the economic situation of their country, which has fallen from the April 2007 high of 83.7 to the current 17.4. El Pais carried an interesting article last week on the situation in Seseña, a huge new "jumbo housing estate" of 13,500 apartments in the province of Toledo (Castilla-La Mancha) south of Madrid (Spain is the country not only of "jumbo" securities, but also of "jumbo" development). Seseña developer, Francisco Hernando is struggling to sell, and so far only 2,500 of the properties at Seseña have a first occupation licence, and only 750 people actually live there. In the Castilla-La Mancha region as a whole, 123,000 new properties have been built in the last 3 years, of which only 39,000 have been sold, implying an overhang of around 84,000 surplus new properties. That is 2 out of 3 of all new properties built in Castilla-La Mancha since 2005. According to the El Pais article, the number of housing starts in the region has risen dramatically in recent years: 31,000 in 2005, 37,500 in 2006, and 47,500 last year. But during the same period demand has remained more or less flat, at around 12,000 sales a year. 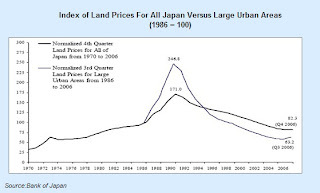 How Much Will House Prices Now Fall? 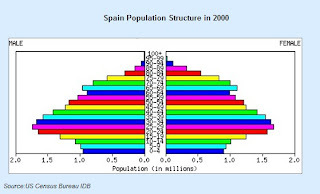 On other fronts, while I personally adamantly refuse to try to put numbers on how far Spanish property prices may fall, since at this point it really is impossible to tell, it is interesting to note that some developers themselves, after having resolutely denied the possible eventuality of a serious price fall, are now begining to recognise the painful reality. This week it has been the turn of Cue Mariano Miguel, ex-president and present board member of the quoted developer Colonial,(which incidentally is itself struggling to stay afloat in a sea of debt). 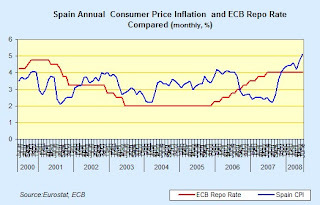 Speaking at a recent conference organised by the Spanish savings bank Caja Madrid, Miguel said that he expects property prices to fall in real terms (after inflation) by between 25% and 30% over the next 2 to 3 years. Well, well, well. So we have a two or three year time delay, which means that any improvement in construction activity (should there eventually be one) will be a longish time coming, and the slump in the construction sector (which has yet to really bite in) will be of some considerable duration. New starts are down this year from last years 600,000 to a current forecast of 200,000, though when the properties being built will actually be sold is, at this point, anyones guess.